Most of you out there know me for my opinions on video games. However, like most people, I have more than a single interest. Lately, I have been absolutely obsessed with the study of Collectible Card Game design. I've been playing a lot of them, and reading a ton about them. From the common pitfalls to the tricks used to improve the playing experience, and even how attract sales. As a child, my experience with different collectible card games wasn't what one might expect. Even though it was (and is) one the top cards games of all time, I had never given Magic: The Gathering a fair shot. Yet as an fan of Saturday morning cartoons, I was a huge Yu-Gi-Oh! fan growing up. Naturally, that meant that I was also an avid player of the card game based on the anime. Even today, I see a certain charm to the game. That said, as I learn more about other card games like Magic: The Gathering and Hearthstone, the more I start to identify problems in my old fling. I tell you all of this so that you realize that what I'm about to say comes from a place of love: Yu-Gi-Oh! is a bad card game. One of the biggest problems in Yu-Gi-Oh! is the unrelenting Power Creep that goes as more and more cards are introduced. Power Creep, for the unaware, is the process in which old cards are no longer played. Not because they are banned in tournaments, but because new cards are so much better than players who use the old cards are in an obvious disadvantage. To an extent, this is common among Collectible Card Games. What separates Yu-Gi-Oh! from the rest is just its prevalence. Among the people who have played for the long time, a common complaint is that the game, as it stands today, is significantly faster than it used to be. Back when it was first released, summoning even one monster with 2500 ATK or more was almost seen as a reward for successfully controlling the field long enough. In comparison, with the newer cards, it is quite common to see multiple 2500+ ATK monsters on grace the field with the first couple of turns. Summoning a bunch in one turn is such a regular occurrence that Raigeki, a card that was on the original ban list since it started in 2004 and remained there for over a decade, is now legal once more. Way back when the ban list was first introduced, and effect that destroyed all of an opponent’s monsters put them at such a disadvantage that it was deemed too powerful for tournament play. At the time, there was even a running joke that Raigeki would likely never be unbanned. Now, tough monsters are so easy to summon that such an effect barely matters all that much. Yu-Gi-Oh! has become a textbook example of Power Creep for exactly this reason. For a while, these changes couldn't really be classified as Power Creep, even if they were stronger than old mechanics. Synchro monsters were a good example of this. Because it's a lot easier to place Tuners and non-Tuners on the field than it is to get an exact combination of monsters and Polymerization in play, Synchro monsters were objectively easier and faster to summon than Fusion monsters. However, it is worth noting that Fusion monsters were incredibly rare to see in play. Aside from a few deck types, like Cyber Dragons, that relied on it, Fusion would rarely come up in either casual or competitive simple due to the abundance of other options. Synchro wasn't so much an example of Power Creep as much as it was a stronger version to an otherwise ineffective and unused mechanic. The problems really started with the advent of XYZ monsters. Even with Synchros, it was hard to take advantage of their increased utility without formulating a deck around them. This drawback was completely lost on the XYZ monsters. To summon an XYZ monster, one would overlay multiple other monsters whose LV is equal to that monsters rank. The monsters used in the summoning would be attached to the XYZ monster as material, which can be normally detached in order to use their effects. In competitive play, players do themselves a disservice if their Extra Deck contains any less than the 15 card maximum. Even if their deck would otherwise not take need to use XYZ in order to do well, the only gain a further advantage by having that option there. Unlike Synchros, the only requirement for an XYZ summoning is to have multiple of the same level in a deck. It is actually harder to think of decks that don't meet that condition that it is to think of ones that do. Since the vast majoring of XYZ monsters are also of Rank 4, and most monsters in the game are LV 4, this is doubly true. Because making use of this mechanic was such a no-brainer and required very little changes to most decks, players would need a very strong reason not to use them. This is a significant part of what people talk about when they use the phrase “Power Creep”. And part of why this Power Creep unchecked is because Yu-Gi-Oh! lacks the concept of a standard format. In most competitive CCGs, as new sets are added to the game, old sets are both phased out and removed from tournament play. This means that at any given time, in the competitive scene, there are only a very specific number of sets in play. While this is mostly done so that new players are free the baggage of thousands upon thousands of older cards, there is a dual purpose at work here. By working under the assumption that old sets will eventually be phased out, designers can work with a certain degree of freedom. They are able to take risks and implement new mechanics under the assumption that if they become unpopular, or worse, too powerful, they can just stop making cards the support that mechanic and slowly let it die as new sets are released. Magic: The Gathering has done this with a number of mechanics over the years, by simply not making or reprinting cards that use certain systems. Yu-Gi-Oh! does not have this freedom, because sets are never rotated out. With the exception of individual cards that have been banned or limited, every card that has ever been released is still officially legal in competitive play. And despite having no mechanism to phase out poor mechanics, Konami continually experiments with new ones. It is inevitable that some of them will end up being objectively faster, or more effective, than their predecessors. With these better sets out in the wild, it's impossible to keep new cards balanced with respect to that which came before. Collectible cards game are still businesses at their core. If no one wants to use the cards from the newest sets, then sales are going to drop. The simplest solution, that requires the least amount of effort, would then be to just make the newer sets even better than the old sets. In the case of Yu-Gi-Oh!, the absence of a standard format makes this even more obvious of a solution since cards don’t ever get phased out. When the next set gets released, if it’s cards aren’t even better than the last ones, we’ll suffer the same problem again. Through it’s very systems, Yu-Gi-Oh! has almost forced itself into a situation of sustained Power Creep. It’s worked for them over the past few years, but there’s only so much room to go. 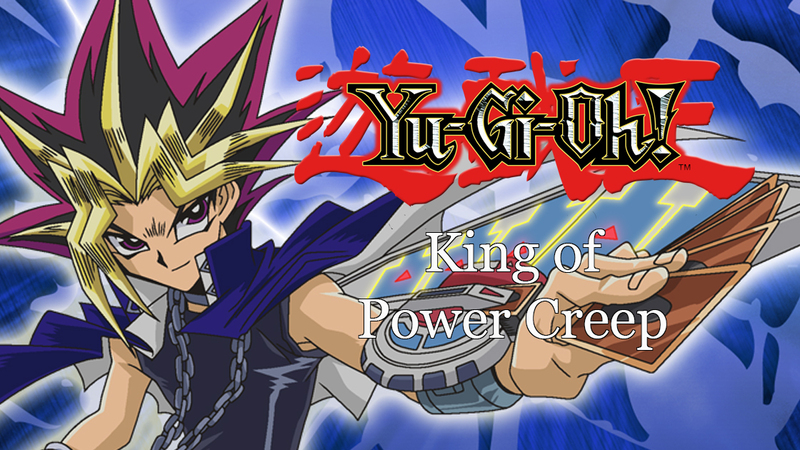 Konami is playing a dangerous game, and it had an immense negative impact on the Yu-Gi-Oh! meta-game, as it stands today. Again, as someone who has played the game since I was in middle school, I will always have a certain fondness for Yu-Gi-Oh!. But despite, or maybe even because, of that fondness, I have massive problems with the current state of the game. Even worse, I don't know if there is even a good solution. If anything, Yu-Gi-Oh! serves as a cautionary tale for why CCGs need to be careful in game design and the introduction of new cards/mechanics. In hindsight, the Power Creep seen in its current state was not only obvious, but inevitable.